Secretary of Homeland Security Kristjen Nielsen faced a mini-firestorm after her interview at the Aspen Security Forum Thursday: Some listeners (and news coverage) understandably but inaccurately saw her as contesting that Russia's 2016 election-tampering was meant to help the Trump campaign. 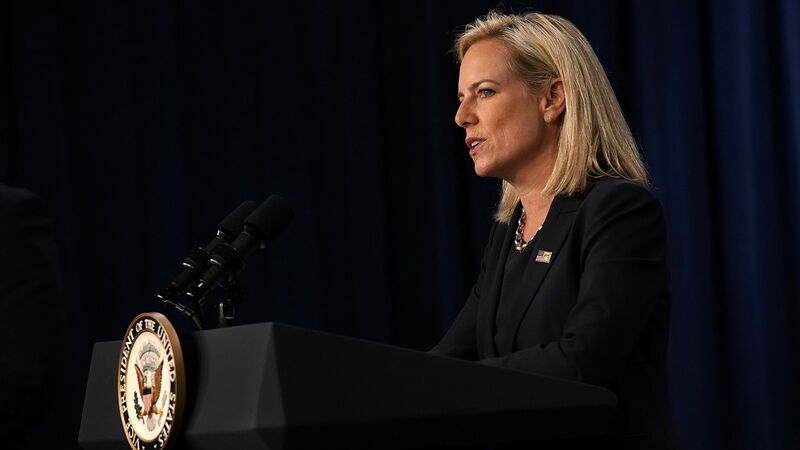 Between the lines: Nielsen danced around providing a clear soundbite to that effect — though she did say she agreed with the intelligence assessment saying exactly that. But much of the criticism she faced is based on misunderstandings of security jargon that the Aspen audience would know. What that means: The key word here is "infrastructure." The Department of Homeland Security uses "election infrastructure" to refer to the voter databases and machines controlled by states. The DHS website specifically reads: "Election Infrastructure does not include: Political action committees[,] Campaigns[,] Or any other non-state or local government election related group." What Nielsen is saying is that attacks on voter databases that happened in Arizona and Illinois were likely not meant to favor either party. There's no public evidence now that any attack on voter databases was meant to favor a political party. The attacks on the Democratic National Committee and other political targets, social media campaigns and propaganda efforts are not included in that statement. And it's the propaganda and leaked emails that most clearly benefitted Trump. What she said, part two: "What we’ve seen on the foreign influence side is they were attempting to intervene and cause chaos on both sides." What that means: In context, "foreign influence" refers to social media campaigns. Nielsen followed that line by citing the massive Russian bot efforts on the subjects of Charlottesville and Syria as examples of campaigns meant to "sow discord and get us all to fight against each other." While there isn't public evidence showing Charlottesville campaigns targeting both sides of the debate (private researchers largely found evidence of a pro-right wing campaign), it's clear Nielsen is discussing the broader issue of social media. Russian-sponsored Facebook ads did target both sides during the election to further divide Americans. None of this means DHS doesn't see Russian activity. Law enforcement and intelligence agencies — including DHS — agree that Russian information attacks on social media are continuing. It's just that DHS isn't seeing an attack on the infrastructure that allows elections to move forward.